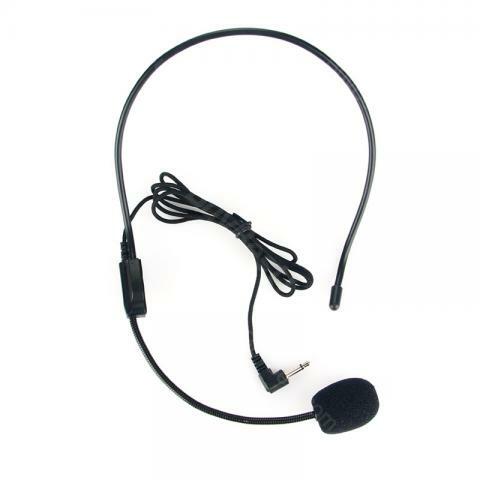 The Head-mounted Microphone is made of APS advanced materials, confortable to use. With 1.05 meters ware, you'll feel free when using. • APS advanced materials, 2.0 to tighten the preparation line, very durable, the length of 1.05 meters, can be free to use. • Wearing a rubber hose, with a very comfortable. • Import single point to the microphone is not easy to produce whistle, clear voice, suitable for a variety of loudspeakers use. • Flexible and light weighted design to optimize microphone positioning for a better long time use. • Elaborate craft is adopted, suitable for singing, interview host etc. • Ergonomic design: 270° flexible spinning angle makes it comfortable to wear. • Quick link: Car External Microphone. I have 8 of these headsets. Always perfect. Fits the standard Sennheiser packs. Great quality. Even matches the skin tone of African-Americans....blends right in. Pastor needed a replacement for his Shure T-1 transmitter. This works perfect. He found it easy to use and his voice is clear over this headset. Price it was great and the microphone is as good as any much more expensive headset. Mike is hot so you might have to lower sound level but we highly recommend it. The only thing im not thrilled about is how thick the adjustable rod is that holds the microphone. it makes it look old to me. But the sound quality is great and that is ultimately what matters for our TV broadcast and internet presence. This is a GREAT Headset! Please note: One size does not always fit all. THis one is unique in that it has ear pieces that make it possible to actaully get it on to one's head. Great for low budget but high quality school dramas! I used these with Jr & Sr students and they worked very well. These mics bend easily to position them for the speaker, and they can be bent back and forth for multiple people without damaging them like some mics which have a stiff wire. With two ear loops, they also stay in place well for kids. We use this at church. It takes a beating and is subject to being transported a lot but it holds up well. It performs great for both speaking and singing.